Even if you must lie on the ground to see it. I wish you all a marvelous weekend and a delightful April 2011 Bloom Day. 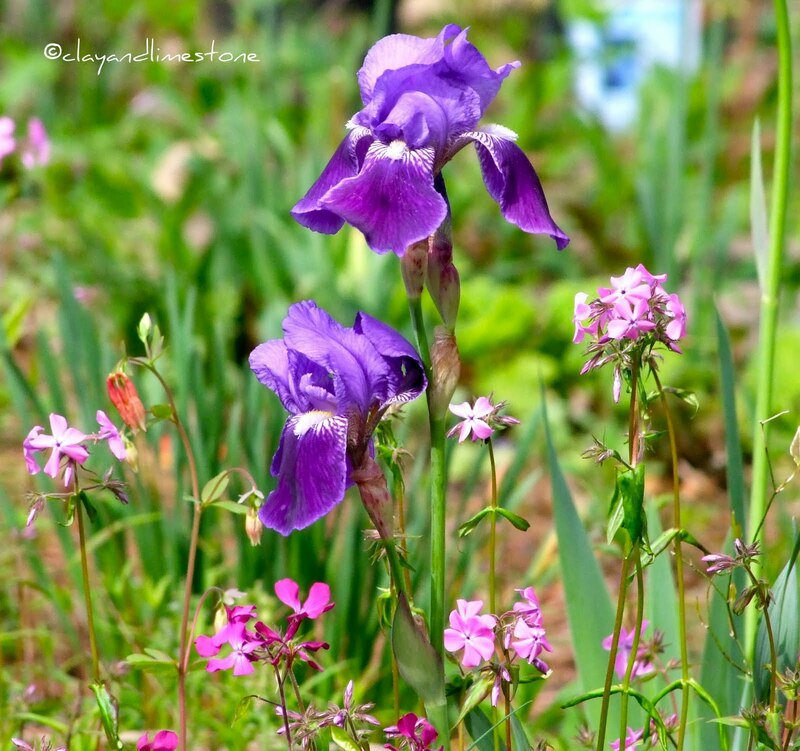 Garden Bloggers' Bloom Day is brought to you by Carol, of May Dreams Gardens. 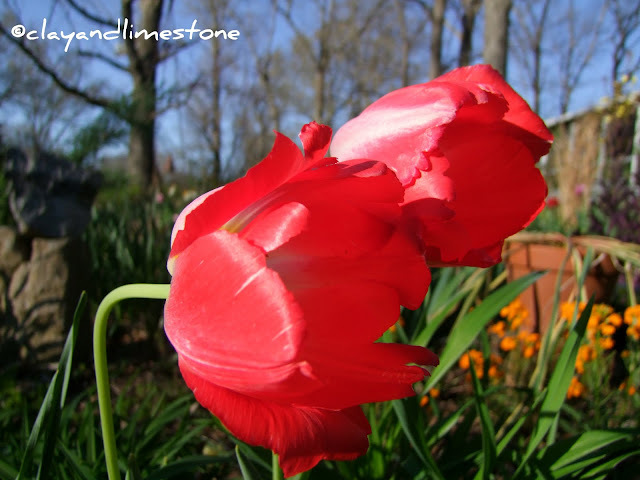 Stop by her blog for links to blogs and blooms all over the known blogasphere. You're in for a treat~it's Spring and gardens are dressed in their finest. Such luscious photos Gail. Your garden is in full spring fling. They look great Gail! It looks like you're a little ahead of us. Your irises are already blooming and except for the reblooming ones ours are still in buds. Your phlox is earlier too! The ragwort you gave us looks great! Gail, They are all so beautiful. I love all these colors as I have too much of orange. I love your blog. Saw those busy bees and hover flies in your previous post. Sumptuous Gail. Your images made me sigh with pleasure - and also hardened my determination to get some epimediums for my next garden, they have to be worth the muddy knees. Great photography Gail! I love the one of the epimedium against the tree trunk. It is spectacular. I don't think I've seen a white epimedium before. I've recently fallen in love with them so this will go on my list. Did I just read that Iris germanica is the TN state flower? Or was it KY? Anyway, it is amazingly gorgeous, as is all of your garden. I hope I get time tonight to do a GBBD post! Oh yes, I'd love to stop time and just enjoy all these spring lovelies. Such a wonderful reminder, Gail, to enjoy the moment. Your garden is looking beautiful dressed in its spring finery. 'Anticipation' of what is to come may be far better than the actuality. That Pooh was so smart. Gorgeous blooms. Happy Bloom Day. Your photographs are absolutely beautiful and show exquisite detail and color. Love it! OH, my! It's all looking so lush and gorgeous. I love that little bit of orange in the first photo from the Aquilegia. And yes, that white Epimedium does require you to get right down on the ground to really enjoy it, let alone get a pix — but they are one of my favorite plants. That Red Tulip jumped off the page at me...I see orange in the back to the right of it too. Very much springtime in your gardens!! Gail, these are so beautiful. I am jealous. Hardly a blooming bud here, and you have a magnificent spring unfurling. Love those iris. Such colors, such beauty! I didn't know you had Epimedium x youngianum 'Niveum' too. Mine has just sent forth its first leaves. Your photos are breathtaking, dear Gail! The white epimedium is being added to the wish list, I had no idea it was so stunning a creature. 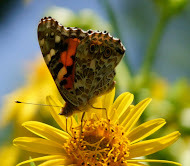 The wildflowers are so happy there, under your loving care. Stunning photos! Your garden is coming along with lots of blooms. The iris has such a beautiful color. Your photos are simply stunning. As if I could reach out and touch the tender petals! I have purple iris, too! I believe I am fortunate, for I'm told they may not survive here in south AL, too wet. I smile at your dear quotes. Thank you for sharing! Fantastic pics. Your subjects are phenomenal. I have the Iris germanica. I believe it to be the Tn. flower. Am I wrong? It has just bloomed out. The first time. I was so thrilled. It was a gift from brother. Oh Gail, that looks so lucious. That Kale is amazing, interestingly, our city has been using it as part of the town plaza planting and I'm struck by the color combination. What a fabulous parade you are showing. Can there be a more welcome month than April? What a gorgeous post Gail. I remember when you posted about adding Blue-Eyed Mary to your garden. It's beautiful. I love the russets tones of your yellow Epimedium. Gail, your pictures and flowers are just beautiful! There's that pretty pink phlox I hear so much about! It really is lovely. I'm glad I'm not the only one that leaves my kale to bolt. 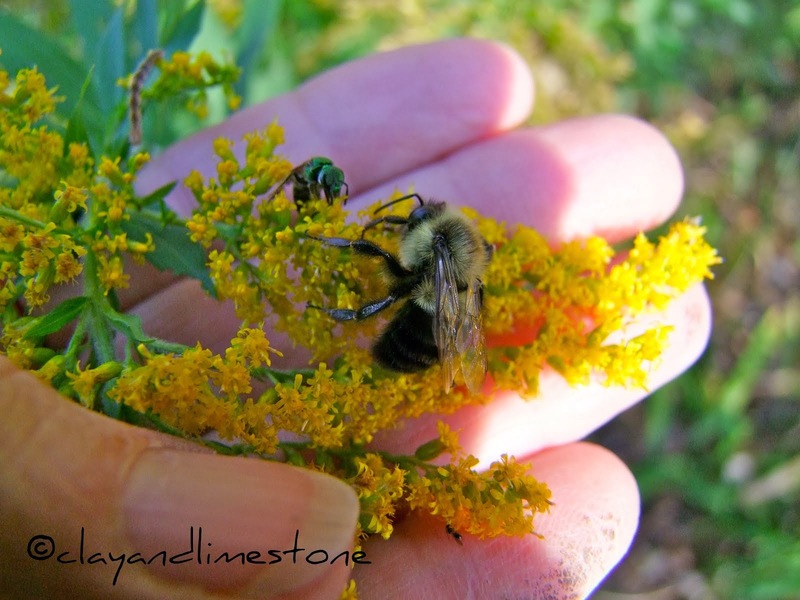 You're right, the bees go bonkers for brassica blooms, and they produce more than enough to keep them all busy, and buzzy, in the garden! That was a delightful GBBD, Gail. Your garden looks fantastic. Gorgeous shots of your spring bloomers, Gail. I need to get me some epimedium. Oh, how I hope I can one day visit C&L in early spring and see all this for myself! Lovely April blooms, Gail;-) I'm still waiting on Epimedium 'Niveum' to bloom (although 'Rubrum' is blooming in all her pink glory. Also waiting on Iris cristata. Today is a really warm day here in northern VA...looks like we could get up into the 80's! Gail, when I see all those gorgeous pictures of your garden it makes me wanting to completely redesign my garden. I'm glad I made it here, Gail. I see the answer to my question was here. I am so excited it's spring! Have a nice Easter. Thanks for your comments about my grand baby and such.